At the 2012 annual meeting of the European Society of Cataract and Refractive Surgeons (ESCRS), Mr. Srinivasan served as teaching faculty member in an instruction course on Pterygium Surgery and Iris Reconstruction Strategies. At the 2013 annual meeting of the European Society of Cataract and Refractive Surgeons (ESCRS), Mr. Srinivasan served as teaching faculty member in an instruction course on Toric Intraocular Lenses. Mr. Srinivasan and his research fellows presented two scientific papers on the outcomes of advanced micro incision cataract surgery. 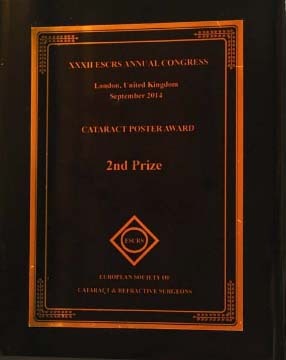 He won the 2nd prize for the best cataract surgery scientific poster. Mr. Srinivasan served as a teaching faculty member on a course on assessing and managing dry eye in patients with cataract. 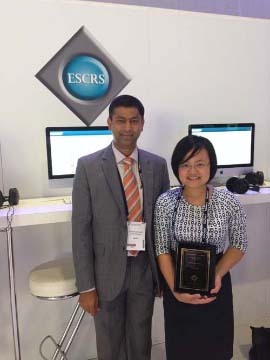 Mr. Srinivasan with his research fellow Dr. Jia Ng following the award for the best poster prize.